Product Management is central to every product development process. 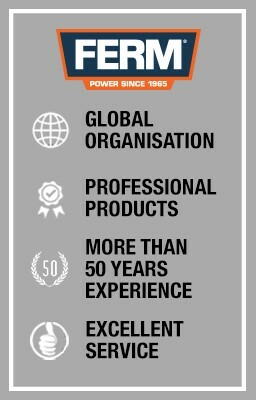 Our extensive experience in the field of power tools has provided us with unrivalled insight into customer demands and expectations. Our critical market analysis, coupled with compliance to all applicable international safety standards, enables our product management to react quickly and supply exactly what the customer is looking for. A power tool is a unique product - not only does the end user develop a relatively intense bond with their chosen power tool; they also tend to own only one product per type. This means that they must be able to depend on it. Which is why we rigorously test each and every product. Not only during the development phase, when every aspect is individually scrutinised; but also in the final stage, when the product is brought to life. Our engineers thoroughly test all of our power tools and end user feedback is always requested prior to market release. FERM passionately believes that quality means supplying a safe and reliable product, which meets customer requirements and expectations. At FERM, this is central to everything we do. All of our processes, including quality processes, are focused on achieving this. Which means that customer requirements and expectations must be clear for each and every product. A drill, for example, must be able to operate for a considerable amount of time on one single battery pack, whilst the same is not applicable for a cement mixer. Using this approach, we strive to deliver the finest possible product at an affordable price.